What does the final report of the Synod on the Family mean for the church? Essentially, the “relatio” (or report) published today, at the close of the Synod, will serve as a starting point for future discussion. It was also presented with great transparency, including even sections that did not win the necessary votes for complete approval. Before we look at five things the synod did, it’s important to understand the unique “form” of this unusual final document. Pope Francis asked to have all of the paragraphs presented in the “final” report, even those that failed to win the majority needed for full passage (a two-thirds majority). Two of those three dealt with LGBT Catholics, and one addressed divorced and remarried Catholics. What’s more, the Pope asked that the voting results be shown alongside all the paragraphs, which were voted on separately. Gerard O'Connell called this a break with 49 years of tradition. In other words, if the final document was published with only the fully approved texts, those three paragraphs would not appear. Why might the Pope have chosen to do this? So what might be the “takeaway” from the Synod? Dialogue: The synod was an “authentic” synod, as Cardinal Christoph Schoenborn said the other day, in that it included actual dialogue. No one can doubt that. For many years Vaticanologists had speculated that such synods had been overly “managed,” that is, participants knew what they could and could not talk about, what they could and could not vote on, and more or less what the final outcome would be. This was clearly not the case at Synod on the Family. In his opening address to the participants, Pope Francis specifically asked the participants to speak freely, and prayed for the gift of parresia (a Greek term meaning, roughly, “openness”). Dialogue is now a part of the church, at the very highest levels, and this is to the good. To me, this seems a rather “Jesuit” model of decision-making. Jesuit superiors know, and explicitly say, that the Holy Spirit can work through everyone—both the superior and those men in his care. It is not simply a "top-down" method of governance. So in Jesuit decision-making there is always great deal of discussion and dialogue, which can often continue for a considerable length of time. At times, it’s uncomfortable. These divisions spilled into the public forum, and then those divisions were taken up by various Catholics worldwide. Frankly, I was shocked at how vitriolic things became, particularly on social media. (For my part, I’ve never received more “hate tweets” than in the last two weeks.) At times even prelates moved beyond the usual politesse of the Roman “bella figura” that one associates with Vatican affairs. On the other hand, this is what the Pope invited, and probably expected, when he called for openness. Transparency. This synod brought us the following: lively daily press briefings with vigorous questioning from reporters, extremely candid comments from many bishops (Remember Cardinal Wilfrid Napier’s terming the interim report as “irredeemable,” and Cardinal Reinhard Marx noting that “obviously” church practice could change), an interim document that was made public, as well published notes from the working groups, and a final document published almost immediately after the voting—with the votes attached. All this shows the Pope’s desire for transparency. And all this is good. It helps to clear the air of the scent of secrecy that attends many of these gatherings, increases the sense of accountability, and, also shows that the church is less afraid of openness. LGBT: One of the biggest issues in the media’s coverage was the emergence of LGBT issues at the Synod—which was, in the run-up to the synod, anything but a sure thing. That is, the synod participants could have avoided it. But from the day that a married couple spoke of their experience with another couple they knew who had a gay son, it was on the table. And to my mind, the media’s focus on the change in tone in the interim “relatio,” on these and other topics, released earlier this week, was entirely justified. The first “relatio” included language about gays and lesbians that was new—dramatically new. (“Welcoming,” “gifts and qualities,” mutual support, “precious” “partners,” etc.) In addition, some bishops, like Cardinal Schoenborn, who spoke of an “exemplary” couple he knew, went out of their way to praise gays and lesbians. So it was indeed newsworthy. Some will see that as a loss and may be disappointed. It’s easy to understand why: the interim “relatio,” which garnered so much attention earlier in the week, and which moved me deeply, spoke of “Welcoming Homosexual Persons.” Just the word "welcome" was refreshing. (By the middle of the week, the new English translation had "Providing for.") Now the synod speaks of “Pastoral Care of the Homosexual Person.” That is quite different. (Would you rather be welcomed or cared for?) Moreover, there is no mention of any “gifts or qualities” at all. But again, the topic of LGBT Catholics is now part of the discussion, and by insisting that those paragraphs were retained (even though they were not approved) Pope Francis is keeping them on the table. Beginning. Lost in some discussions of the Synod was that the last two weeks represented only Part One. After this, the bishops and participants will return to their home dioceses and the worldwide church will reflect on these proceedings until the next session, in October 2015. In the interim, the “World Meeting of Families” will take place in Philadelphia (with Pope Francis most likely attending) with similar topics being raised in talks, articles, homilies and the like. So there will be further reflection. Next October, the synod will meet again in Rome. (With some different bishops, by the way, for example, Archbishop Cupich, now of Chicago.) And, finally, Pope Francis will issue his “apostolic exhortation” on the Synod, a document which enjoys a high level of teaching authority. Thus, while the synod is an important consultative body and Francis is very much in favor of “synodality,” his is the final word on all these issues. At times, when I was getting too involved in the daily press conferences, I reminded myself that, while these discussions are important and show the temperature of the church on certain issues, the apostolic exhortation will be the most important document. When I read the documents of the Second Vatican Council, for example, I’m not that concerned about what Cardinals Ottaviani and Bea thought at the time, as much as I am with the final product. I’m more interested in “Lumen Gentium” and “Gaudium et Spes” than one cardinal’s particular “intervention” during one session of the Council. All in all, the last two weeks have proven a very Jesuit “way of proceeding,” as St. Ignatius Loyola would say. It’s what we call “discernment,” which includes prayer, as well as much discussion, some division and even some debates. For Charles Chaput of Chicago read Blaise Cupich. I know it's been a long fortnight; thanks for the effort. Excellent commentary/analysis. Thanks. Especially liked this analogy used to provide perspective: "When I read the documents of the Second Vatican Council, for example, I’m not that concerned about what Cardinals Ottaviani and Bea thought at the time, as much as I am with the final product. I’m more interested in 'Lumen Gentium' and 'Gaudium et Spes' than one cardinal’s particular 'intervention' during one session of the Council." For those not fluent in Italian, would you consider adding a link to a translated relatio when one becomes available? Thanks! Another clear outcome of this synod is the somewhat surprising near unanimous confirmation of the teaching in Humanae Vitae and Familiaris Consortio in the final Relatio. Paragraph 18 had 175 positive votes (placet) and 5 opposed (non placet). That is >97%. A second is Pope Francis's confirmation of the Church's Infallibility beyond that limited to ex cathedra statements. In his final speech, he said: ""This is the Church, our Mother! And when the Church, in the variety of her charisms, expresses herself in communion, she cannot err." On the whole, an excellent outcome for fidelity in this synod, including the paragraphs on homosexuals (not "gay," which has a lifestyle meaning nor "LGBT", which includes self-identifying bisexuals and transgenders), which encourages the Church to evangelize more specifically to these individuals. I understand how you read "she cannot err" but I read this as shorthand for the standard definition of the "sensus fidelium" which is a consensus of the People of God, not the Magisterium apart from the whole Church. I did not read it as the extension of Magisterial infallibility that had been advocated by the two preceding popes. The term "she cannot err" can only mean a form of infallibility, expressed by the bishops "in communion" (ordinary magisterium) and it is clear it is not the ex cathedra kind. The sensus fidelium (defined by VC II's Lumen Gentium as all the faithful in agreement with the pope) is a third form of infallibility (the unanimous form), which he mentions next. Also, the longest quote from Pope Francis in this speech is the beautiful quote from his predecessor on authority as service. The whole tenor of Pope Francis's speeches is 1) complete fidelity in doctrine (not to "neglect the deposit of faith") and 2) new ways of pastoral outreach to "the fallen brother" and "the lost sheep" (his terms). The lost sheep cannot be saved by "a deceptive mercy that binds the wounds without first curing them and treating them." And we should not show a "hostile inflexibility" to new ways of evangelization and pastoral outreach. The Holy father is opposed to the opposition of Truth and Mercy. The only true mercy is one that brings one to the fullness of the Truth. Keep in mind that it is only because the Church "cannot err" that it can confidently look at making pastoral changes. Otherwise, it could be paralyzed by the fear of error and the concern that our latest "solution" to some burning problem will turn out to be wrong. Or, worse, as Pope Frances said, we can be tempted to think we are owners of the truth, not servants. Infallibility is knowing with certainty. And knowledge is liberating. Infallibility gives the Church the freedom to know what is right and how to act. "Frankly, I was shocked at how vitriolic things became, particularly on social media." It was not a particularly good week for Catholic media; showed just how far left to go to ease these meaningless tensions & attacks on various groups. Thank you for the clear and incisive summary. I have three further questions, though. First, what are your thoughts on the connection between Francis' evident concern to promote "synodality" and the formula "you discern, we discern, but I decide"? Second is the related question about the "grass roots," whom Francis advised in his Mothers Day Angelus "bother your pastors!" To what extent is Francis relying upon an actively pursued "sensus fidelium," which is perhaps the Church's sleeping giant? Third, do you think the exhortation at the end of the 2015 Synod will be crafted by Francis to cultivate synodality or lay participation, or both? Thank you for a great summary of the final report. The 2014 Synod was limited to the Presidents of the Conference of Bishops and others (a most conservative group in the style of the past two popes). It is a testament to the Holy Spirit that just about every issue has been left on the table for further discussion and decision-making. 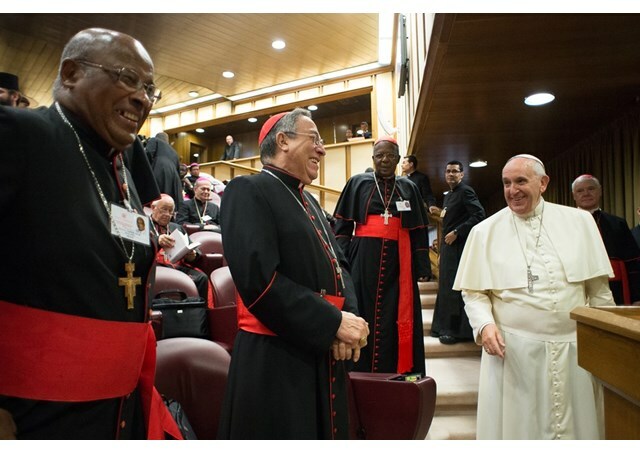 Unlike the 2014 Synod, the November 2015 Synod will consist of almost all worldwide Bishops, as well as others. We will have to await to see what exactly the final report of the 2014-2015 Synod on the Family becomes and what Pope Francis decides to do in his much anticipated Apostolic Exhortation. It will also be interesting to see what new explanations of moral teachings will look like, especially given that the past 46 years of explaining certain teachings, such as Humanae Vitae, has resulted in profound non-reception. Until Pope Francis issues his Apostolic Exhortation, there will be those who will applaud the status quo, and others who want responsible change even if it is a pastoral change regarding the application of moral norms as expressed in past teachings. Let's pray that the final outcome will reflect God's Will. It takes time for the Church/magisterium to change, and we hope that the outcome of the Synod on the Family will be the start of a much welcomed and needed reform. I judge that many people, in and out of the Church hierarchy, need to take a deep breath and relax. I am particularly troubled by the line: "For my part, I’ve never received more “hate tweets” than in the last two weeks." Father Martin, you are a dear sweet man, and loved. God bless you for all you do. Today is the feast day of St. John Paul, as Pope Francis remembered him today. http://en.radiovaticana.va/news/2014/10/22/universal_church_marks_first_feast_day_of_st_john_paul_ii/1109130. With the beatification of Pope Paul VI at the beginning of the week (a fitting close to the synod) and the near unanimous support among the synod of his pivotal decision, Humanae Vitae, and the very wise and balanced language the final Relatio ended up with, this has been a very good week for the faithful. Although, one could reasonably complain that all the discussions that the media paid attention to were "first world" issues about a very small fraction of the world's Catholics - meaning the real threats to the family in the world, experienced in the developing countries (polygamy, poverty, violence, religious persecution, disease, etc.) did not get sufficient attention. As to the full synod, I note that Africans and Asians are now more numerous in the Church than Europe and North America combined, and those regions are continuing to grow, while Europe continues to decline. Africa now has more people than the whole of the Americas, North and South! So, I would expect to see the influence of the developing world to increase in the 2015 synod. The so-called unanimous support for Humanae Vitae and the works of JP II by a conservative part of the full Synod of Bishops only points to the papal teaching and not to any pastoral guidelines and changes that may spring forth at the conclusion of the 2014-2015 Synod on the Family. The objective of the Synod on the Family was not to discuss or change doctrine or specific teachings, but to focus on pastoral theology. While the principles and philosophy that underpin teachings will likely be part of the discussion, certain teachings such as Holy Communion for the divorced and remarriage touch on many issues. Hopefully, we will see changes. Let's pray that the Holy Spirit guides the Synod Fathers and Pope Francis on the issues of conscience and concrete circumstances in Catholic married life toward responsible changes in the application of the moral norms that underpin the many moral teachings on the family. A continuation of the status quo and inadequate and unconvincing explanations of moral teachings will not resolve the profound worldwide non-reception of HV and other sexual ethical teachings. Many moral teachings continue to be controversial.